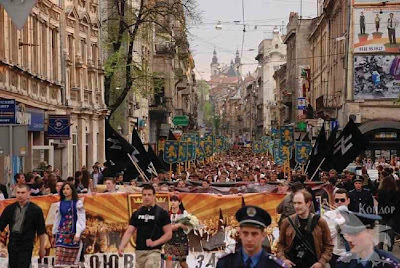 “March of the Greatness of the Spirit” (Marsh Velychi Dukhu), celebrating the 68th anniversary of the establishment of Waffen-SS Galizien, Lviv, April 28, 2011. Emphasizing camaraderie, honor, and the ‘holy’ duty to follow orders, the veterans presented themselves as ‘the vanguard of European unification,’ and their comrades as having fallen ‘for Germany and Europe. They claimed to have fought for a united Europe, ‘which we, in our Divisions, envisioned during the defensive struggle against the onslaught from the East. 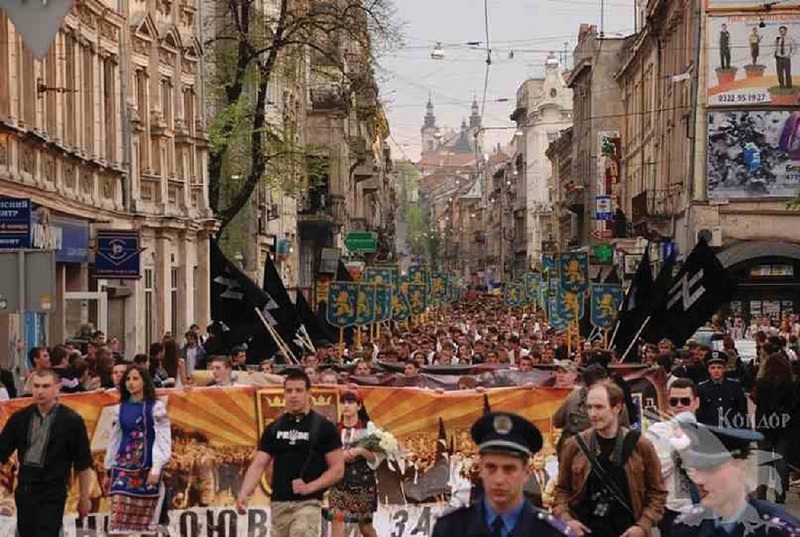 Similar groups are active and supported all over Eastern Europe, many with seats in their respective parliaments. 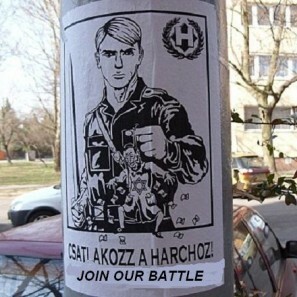 This poster shows a local Aryan in uniform, fairly similar to the SS, holding a Jew by his hair. The little Jew is ugly, his face distorted and he has a hooked nose and is trembling with fear. The pockets are designed to express that Jews have “Pockets full of money”. The text translates to JOIN OUR BATTLE. The poster is not from Germany, in the years of 1932 to 1945, but it is printed now, tens of thousands of copies all over Hungary (Date Picture – March 2012).